Ignition Coil Set-Super Coil Set ACCEL 140043-8. Specialized high temperature epoxy resists shock and vibration, while increasing thermal conductivity. These are direct plug replacements for OEM coils. They feature bodies and, or secondary towers molded in ACCEL yellow and feature brass secondary contacts (except direct fire coil on plug applications). Product Description - Extended 240 : Super Coil Set; Silicone Magnetic Steel Cores; Direct Plug-In Replacement; Square Coil w/Vertical Bolt Holes; OE PN; Set Of 8. Associated Comments - 2000 : Super Coil Ignition Coil. 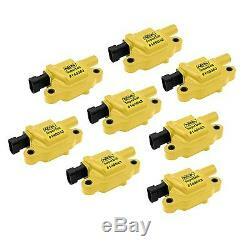 Product Description - Long - 80 : COIL GM LS2 LS3 LS7 8-PACK. Product Description - Short - 20 : Ignition/Electrical. See Item Specifics section for additional specifications about this part. To confirm that this part fits your vehicle, enter your vehicle's Year, Make, Model, Trim and Engine in the Compatibility Table. Also review the notes section in the compatibility chart for additional specifications about this part. The engine types may include 4.3L 262Cu. V6 GAS OHV Naturally Aspirated, 4.8L 294Cu. V8 FLEX OHV Naturally Aspirated, 4.8L 294Cu. V8 GAS OHV Naturally Aspirated, 5.3L 323Cu. V8 FLEX OHV Naturally Aspirated, 5.3L 323Cu. V8 GAS OHV Naturally Aspirated, 5.3L 5328CC 325Cu. V8 ELECTRIC/GAS OHV Naturally Aspirated, 5.3L 5328CC 325Cu. V8 FLEX OHV Naturally Aspirated, 5.3L 5328CC 325Cu. V8 GAS OHV Naturally Aspirated, 5.7L 350Cu. V8 GAS OHV Naturally Aspirated, 6.0L 364Cu. V8 GAS OHV Naturally Aspirated, 6.0L 5967CC 364Cu. V8 BI-FUEL OHV Naturally Aspirated, 6.0L 5967CC 364Cu. V8 CNG OHV Naturally Aspirated, 6.0L 5967CC 364Cu. V8 ELECTRIC/FLEX OHV Naturally Aspirated, 6.0L 5967CC 364Cu. V8 ELECTRIC/GAS OHV Naturally Aspirated, 6.0L 5967CC 364Cu. V8 FLEX OHV Naturally Aspirated, 6.0L 5967CC 364Cu. V8 GAS OHV Naturally Aspirated, 6.0L 6000CC 366Cu. V8 GAS OHV Naturally Aspirated, 6.2L 6200CC 378Cu. V8 GAS OHV Naturally Aspirated, 7.0L 7011CC 427Cu. V8 GAS OHV Naturally Aspirated, 8.1L 496Cu. V8 GAS OHV Naturally Aspirated. This part fits vehicles made in the following years 1999, 2000, 2001, 2002, 2003, 2004, 2005, 2006, 2007, 2008, 2009, 2010, 2011, 2012, 2013. This item may interchange to the following part numbers from other brands. Brands: KARLYN/STI Part Numbers: 5115. Parts Boulevard your one stop for Performance and Replacement Auto Parts. Portions of the part information on this page have been provided by WHI Solutions, Inc. The item "Ignition Coil Set-Super Coil Set ACCEL 140043-8" is in sale since Thursday, August 31, 2017. This item is in the category "eBay Motors\Parts & Accessories\Car & Truck Parts\Ignition Systems\Coils, Modules & Pick-Ups". The seller is "partsboulevard" and is located in Hillsboro, Oregon. This item can be shipped to United States, Canada, United Kingdom, Denmark, Romania, Slovakia, Bulgaria, Czech republic, Finland, Hungary, Latvia, Lithuania, Malta, Estonia, Australia, Greece, Portugal, Cyprus, Slovenia, Japan, Sweden, South Korea, Indonesia, Taiwan, South africa, Thailand, Belgium, France, Hong Kong, Ireland, Netherlands, Poland, Spain, Italy, Germany, Austria, Russian federation, Israel, Mexico, New Zealand, Philippines, Singapore, Switzerland, Norway, Saudi arabia, Ukraine, United arab emirates, Qatar, Kuwait, Bahrain, Croatia, Malaysia, Brazil, Chile, Colombia, Costa rica, Panama, Trinidad and tobago, Guatemala, Honduras, Jamaica.